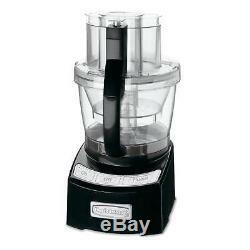 Cuisinart FP-12BK Black 12-cup Food Processor. Product Description: This Cuisinart Elite Collection 12-cup food processor sets the bar with a 4-cup work bowl nested inside the big bowl, plus an adjustable 6-position slicing disc and reversible shredding disc, it provides home chefs with multiple food processors in one. Included items: Processor, 12 cup and 4 cup bowl, slicing disc, shredding disc, spatula, mixing blades, How-to-DVD, recipe/instruction book. Easy On/Off Locking System with Push-Button Release. Stainless Steel Adjustable Slicing Disc (1 to 6mm). Stainless Steel Reversible Shredding Disc (fine/medium). On/Off/Pulse with Blue LED lights. All removable parts are dishwasher safe. Dimensions: 13.8 wide x 12.3 deep x 19.5 tall. You may contact your states Department of Revenue for details on how to file this return. The item "Cuisinart FP-12BK Black 12-cup Food Processor" is in sale since Monday, September 11, 2017. This item is in the category "Home & Garden\Kitchen, Dining & Bar\Small Kitchen Appliances\Food Processors". The seller is "overstock" and is located in Utah. This item can be shipped to United States, Canada, United Kingdom, Denmark, Romania, Slovakia, Bulgaria, Czech republic, Finland, Hungary, Latvia, Lithuania, Malta, Estonia, Australia, Greece, Portugal, Cyprus, Slovenia, Japan, China, Sweden, South Korea, Indonesia, Taiwan, South africa, Thailand, Belgium, France, Hong Kong, Ireland, Netherlands, Poland, Spain, Italy, Germany, Austria, Russian federation, Israel, Mexico, New Zealand, Philippines, Singapore, Switzerland, Norway, Saudi arabia, Ukraine, United arab emirates, Qatar, Kuwait, Bahrain, Croatia, Malaysia, Brazil, Chile, Colombia, Costa rica, Dominican republic, Panama, Trinidad and tobago, Guatemala, El salvador, Honduras, Jamaica.